Voted #1 English Language School in Canada. ILAC Toronto is the leading language school located in Toronto, Canada's largest city. During its existence the school received international recognition in the field of the educational industry, the reputation of an educational institution that ensures high standards of teaching and living, and the organization of leisure for students. Toronto is Canada's largest and fastest growing city, an hour's drive from Niagara Falls! All campuses have good transport links, which makes it easy to explore this city. ILAC Toronto also organizes excursions to Washington, New York, the French province of Quebec, and others. ILAC Toronto offers a wide range of programs. The curriculum can be adapted for the individual needs of each student. At the end of the preparatory program, you can also try to enter Canada's universities, and experienced school experts will help you in this. Are you an international student who wants to study at a Canadian University or College? 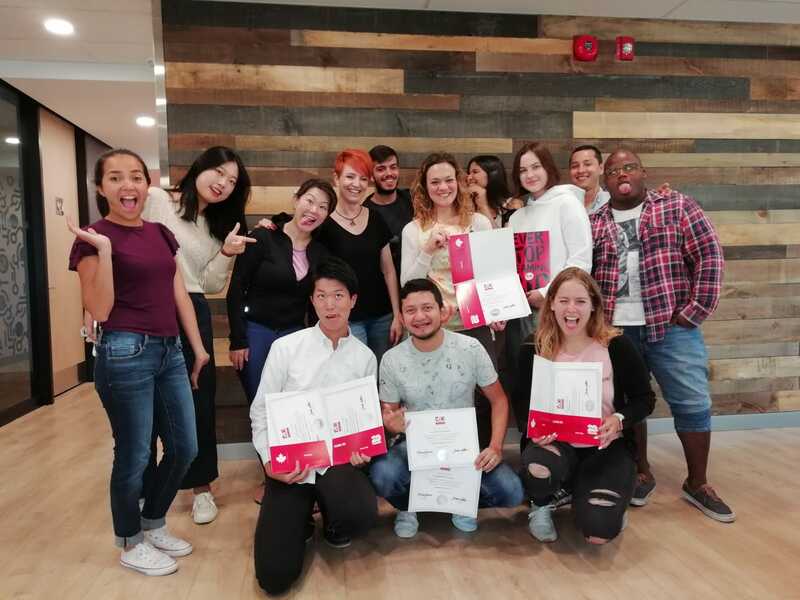 ILAC's award-winning Pre-Degree Program prepares students for Canadian post-secondary and teaches sophisticated fluency and written English skills. Students learn to write university essays of 1000+ words, strategies for teamwork in an academic environment, critical thinking, time management, oral presentations, exam techniques, academic research and IELTS preparation and practice. University placement specialists help students enroll in ILAC’s 62+ partner universities or colleges throughout Canada. All graduates are able to achieve a successful TOEFL score of 80 - 100 iBT. Students who test at the Pre-Advanced level can begin the program immediately (Pre-Degree 1). Students who test below Pre-Advanced will begin in the General English program. The curriculum for the course "General English" is designed for the development of conversation skills, learning grammatical structures and increasing the vocabulary. Each level of General English is 4 weeks. Students can learn as many levels as necessary. The minimum duration of the program is 2 weeks. Students undergo written and oral tests on the first day of training to determine the level Students with Beginner and Intermediate levels (1 to 9 levels) will study General English Students with Advanced level (level 10 and higher) can choose another class or continue to study General English. Business English courses are taught in English for use in professional business situations. The Business English Courses teach English fluency for use in professional business situations. Students learn business through listening, reading, speaking, writing alongside real case studies and current events. Students also prepare for the Cambridge Business Examinations (BEC). Students learn through listening, reading, speaking, writing along with real case studies and current events. Students can pass any number of levels. The minimum duration of the course is 2 weeks. Students undergo written and oral tests on the first day of training to determine the level. TOEFL preparation course gives students all the skills needed to take the TOEFL test and achieve their desired score. Teachers are experts in training students for test taking. They will give you the skills, confidence, and techniques to help you achieve your goals. The minimum course length is 2 weeks, certificate is earned after 4 weeks. Students may study for as many levels or weeks as required to achieve their desired score. Students take a written and oral placement test on the first day to determine their English level. Beginner and Intermediate students start in General English Principal classes and begin taking TOEFL Exam Preparation elective classes in Level 8. After completing Level 9 (or any higher level) of General English, students can begin the TOEFL Exam preparation course as their Principal class. Students tested at Level 10+ are immediately eligible to enter the TOEFL Exam Preparation course. School's program follows the Cambridge Methodology which is the most effective way to build English fluency and improve verbal skills. Cambridge Exams are internationally recognized for life and are considered the best indicator of English proficiency. Students who study the Cambridge FCE, CAE program improve their overall English and can communicate fluently with native speakers. These exams are intended for students with advanced level of English who can use written and spoken English for professional and academic purposes. The minimum language level for this course is Pre Advanced. - work on the technique of passing the exam. This training program, under the guidance of professional teachers, will help students acquire the skills, confidence and techniques required to pass the IELTS exam, and get the right amount of points. IELTS Preparation course will ensure you have all the skills necessary to take the IELTS test and achieve your desired score. Teachers give students strategies for success in the IELTS (International English Language Testing System) exam and covers the four major sections in-depth: speaking, listening, reading and writing. Students take a test IELTS exam every two weeks to assess their progress. Tracking their progress, students know when they are ready for the formal exam. The relationships you form with the people you live with can last a lifetime. Students have great experiences with their homestays and often feel like they are part of a second family. ILAC's English speaking families are carefully selected to meet all the needs of its students. Canada has one of the most multi-cultural populations in the world and ILAC invites students to experience this diversity firsthand by living with one of the wonderful homestay families. Enjoy of state-of-the-art facilities while living with other ILAC students! Dream House Residence is well located in the family-oriented area of St. Clair and Bathurst surrounded with excellent night life, restaurants, markets and grocery stores. Conveniently located at one of Toronto’s most lively neighbourhoods, entertainment is just out the door! - 30 minutes to ILAC. Meet other students from major Toronto schools such as Ryerson University, George Brown College, and University of Toronto. Live right in the heart of the city surrounded by restaurants, shopping malls, libraries, nightlife, and much more! - free Wi-Fi, social events, and much more!